Texas MedClinic is an Urgent Care center in San Antonio, Austin and New Braunfels. Open early and closing late, Texas MedClinic is available whenever you need it, especially in their 24/7/365 location on Wurzbach in the Colonnade Shopping Center. 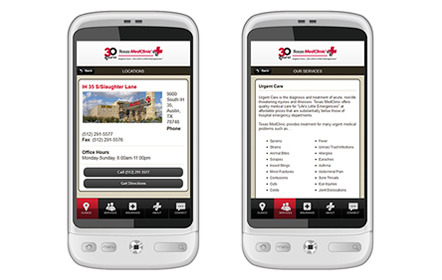 About a year after completing their website, Texas MedClinic returned to us to build a mobile site with their locations, especially their 24-hour center, and their services as the main features. 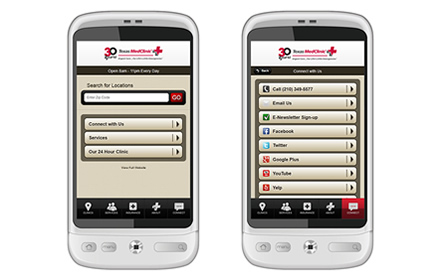 For them, the mobile site would be another tool to push their branding and increase their exposure to smartphone users. 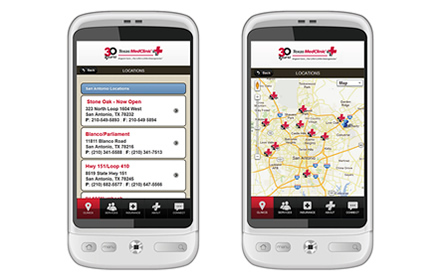 We enabled the use of GPS tracking and zip code finder on the mobile site to find the closest Texas MedClinic available according to a user’s current location or zip code. Integrating SEO only widened their reach to more users and put them on par with other national mobile sites with similar services.